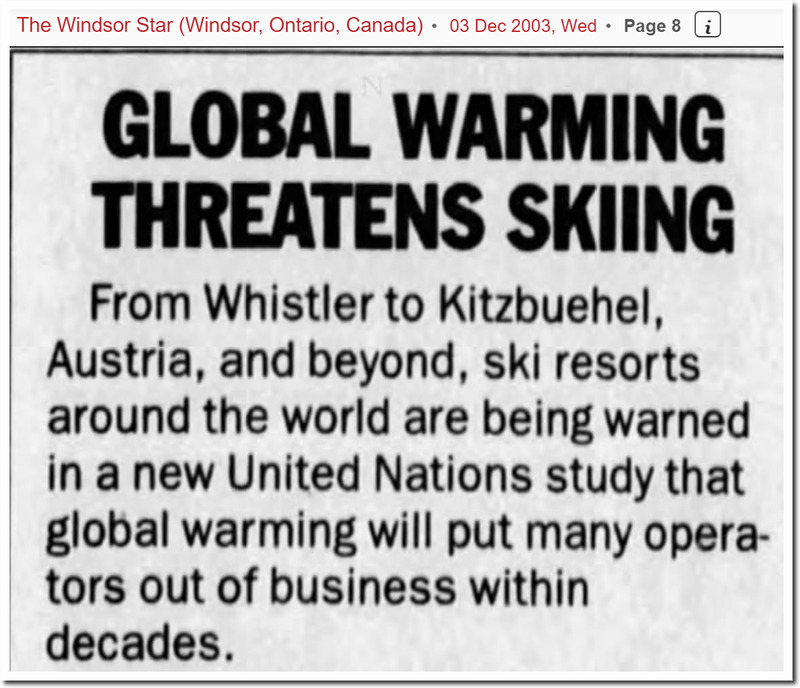 A quarter century ago, the world’s leading climate experts predicted the end of skiing. Winter snow cover has been increasing for 50 years. It wasn’t always like this though. In 1932, the Winter Olympics almost had to be cancelled because of a lack of snow. These sort of mispredictions are what happen when science is based around superstition and politics, rather than any actual science. They are not scientists, they are leftist activists parading in lab coats. Leftists require that their “science” be politically correct, but not correct. It’s all show, and no go. Henry: Uh-huh. [collects a folder from behind him] Here we go. Father dying, right? Henry opens the folder and examines the records inside, going page by page. Henry: Father dying last year. Mother dying last year. Mother and father dying. Mother, father and older sister dying. Mother dying and older sister pregnant. Older sister dying and mother pregnant. Younger sister pregnant and older sister dying. [pauses] Here’s an oldie but a goody: half the family dying, other half pregnant. Here’s a look at snow accum. % by decade. 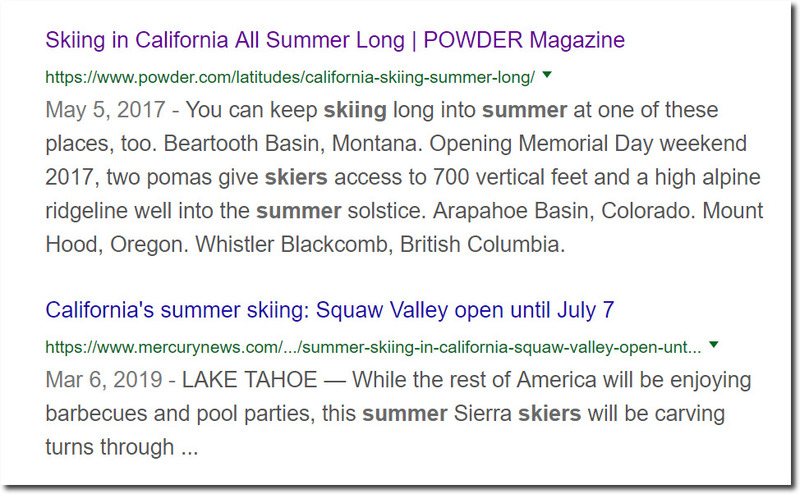 It may have snowed less for a couple decades across the West and South, but we have come back to near normal. Scientists: There is photographic evidence that the polar ice caps are melting at an alarming rate. You: It snowed today, so it’s not really getting warmer. Ice at the South pole is growing. 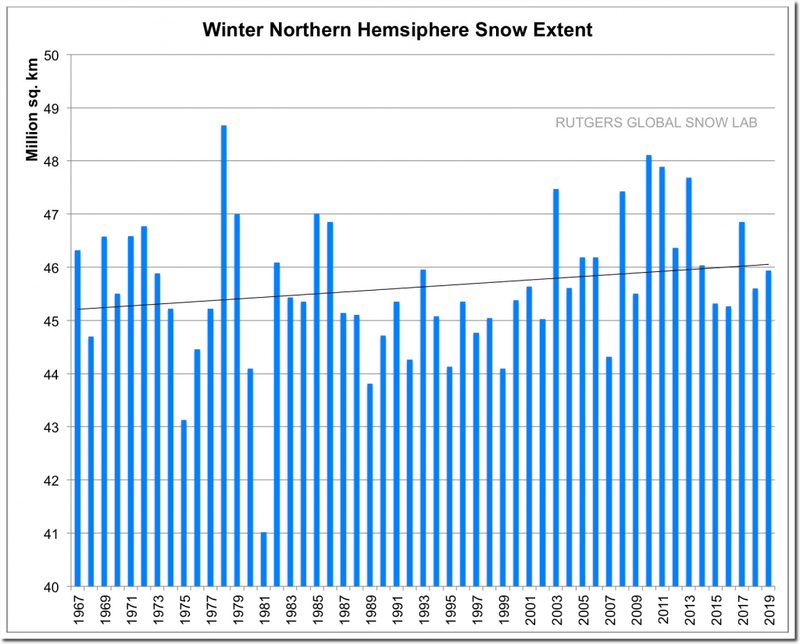 What part of “snow extent increasing” don’t you understand? Uff da! That doesn’t compute. I’ve taken lots of photos. Taking one of a large bear was alarming. How anyone looking at it could know the degree of alarm is baffling. Watching ice melt doesn’t compare. Alarm! Alarm! Alarmists live their lives wearing wet diapers. I think it is sad how the beauty of science has fallen into disrepute, so we can’t help but chuckle when we hear, “Scientists say”. What has made us so cynical? One problem is that colleges produce many young “scientists” who have huge college loans to pay off. For four years they have lived where money doesn’t matter, and suddenly they are ejected into a world where money matters very much. They are a quarter million dollars in debt, and went to college under the illusion that a degree in “science” would get them a six-figure salary, but there are a huge number of other “scientists” regurgitated by colleges also looking for work. Many find themselves working several jobs in coffee shops and as interns for eye-doctors, far from the subject they studied, just attempting to make enough of a five-figure income to pay loans and break even. When a job appears that actually involves some degree of the subject they studied, they will leap at it. And they will work very hard to please the boss. When hired by the UBBF (United Brotherhood of Broccoli Growers) they will search for scientific proof Broccoli is vital to human health, but if hired by UCCF (United Corporation of Chicken Farmers) they will sweat bullets to prove chicken soup is the only sure cure for the common cold. In some ways it is a humiliation for scientists to descend from the Ivory Towers of academia into the mundane reality of Real Life. Their teachers should get some of the blame, and not get fat as their students get poor. Teachers should only be paid a percentage of their student’s salary, perhaps 1% for the next fifteen years. This would make teachers be a bit more realistic. The only other feasible alternative seems to be to skip college altogether. Rather than be in debt to a college, be trained by your boss. Rather than sell your soul to academics for a quarter million dollars, promise your boss you will work for him a set time, perhaps ten years, if he teaches you his trade. This is a very ancient idea, (the idea of becoming an “apprentice”), but it works. 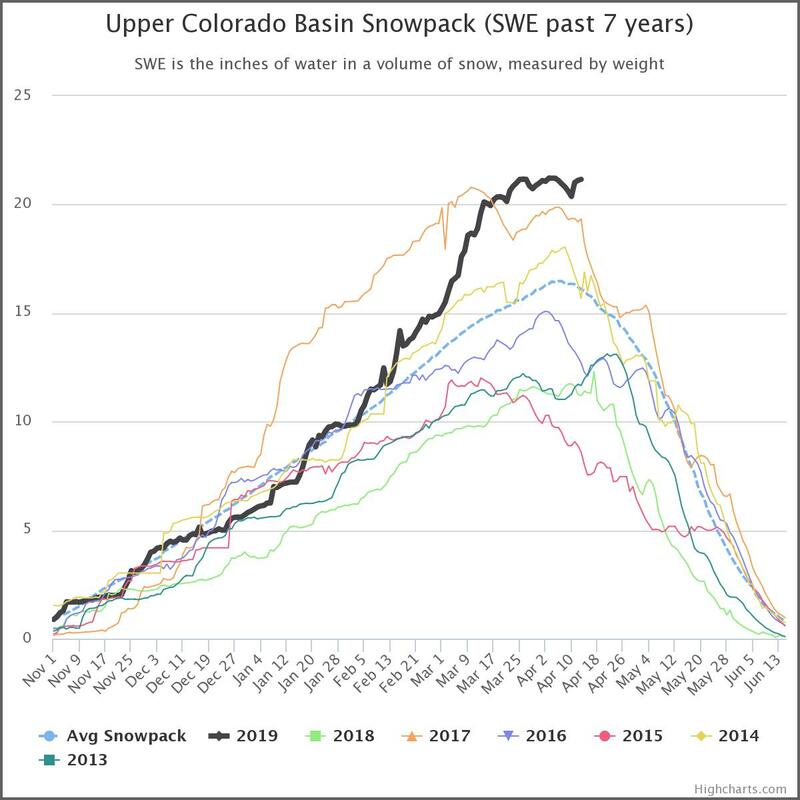 Colorado River Snowpack continues its horizontal trend, defying the historical maximum of April 6. 5 and 7 day precip forecast has 2-3 inches for Wyoming Wind River basin and about 1-1.5 for western Colorado Rockies. Models have continued snow into last week of April. So the current state may endure into May. Current trace following 2011 almost exactly…a 12 million Acre Foot Apr-Jul runoff year (average is about 7).